We were originally supposed to visit the Tibetan Museum during our visit but it was closed for renovation, so we made a brief visit to the Canggu Nunnery instead. 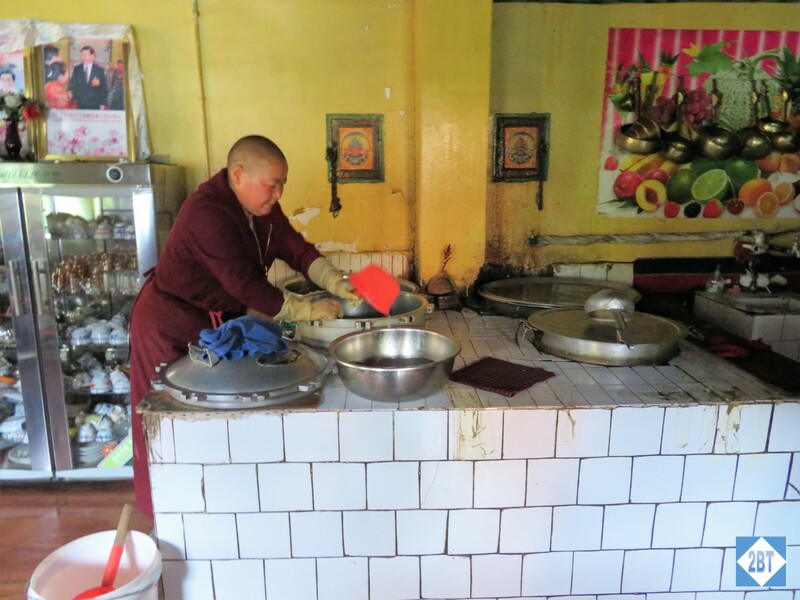 While Catholic nuns typically cover their heads, Buddhist nuns shave theirs and their habits are very similar to the monks’ garments so when we first saw a nun outside the nunnery some of didn’t realize at first it was a woman we were seeing. 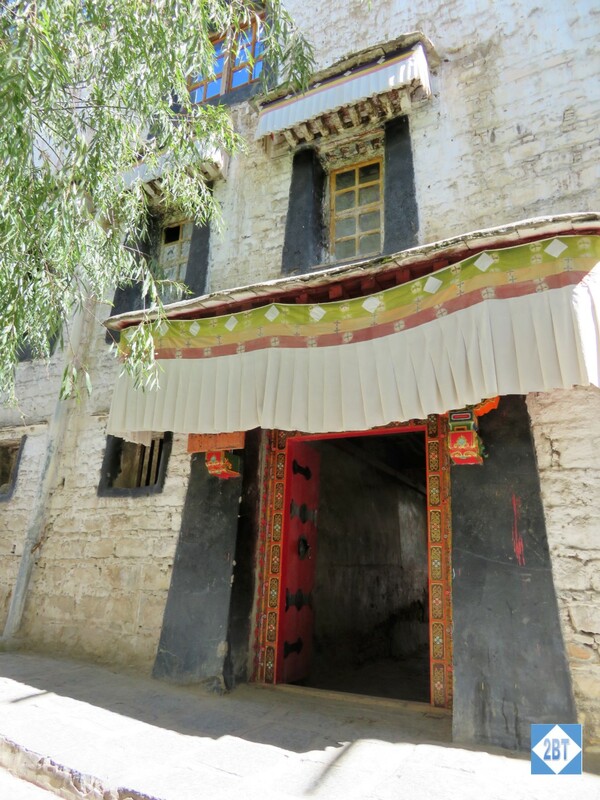 As we waited in the courtyard for the group to come together, I looked up and realized that the balconies on the second floor of the nunnery bore a great deal of resemblance to the second floor of the home we’d visited on the way in from the airport. Lots of colors, especially red, yellow and blue. As some sort of service was about to begin, we had to walk through the nunnery fairly quickly. The nuns were all gathered in the center of the room meditating or praying, it seemed. We basically just circled the room along the walls, taking photos as we went. Looking back it seems strange that I didn’t want to take photos of the lay people worshiping outside the temple but it didn’t occur to me NOT to take photos of the nuns who were also worshiping. I don’t know why it seemed different to me or if I just in such a photo-taking mode that the thought didn’t occur to me. As we walked out, we passed by the kitchen where one of the nuns was working on lunch for the others. 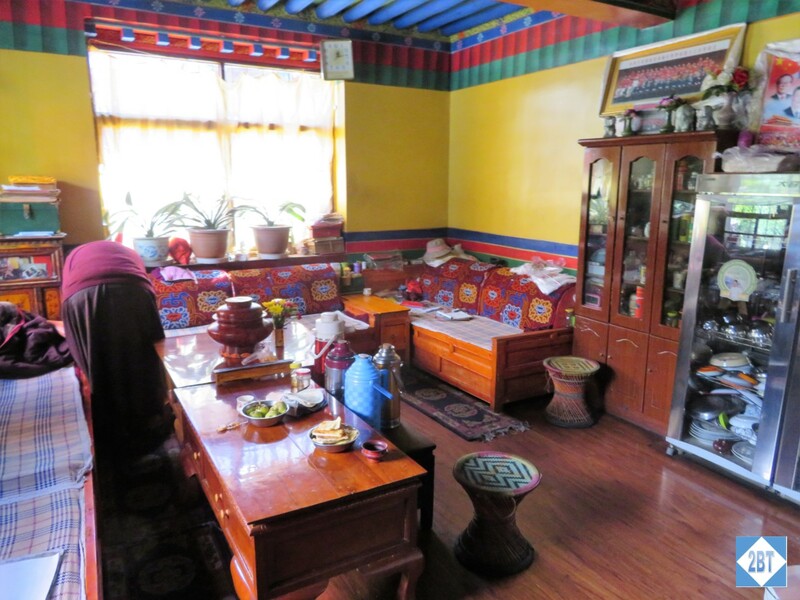 There was also another small room that, if it had been in a private home, could have been a den or family room. 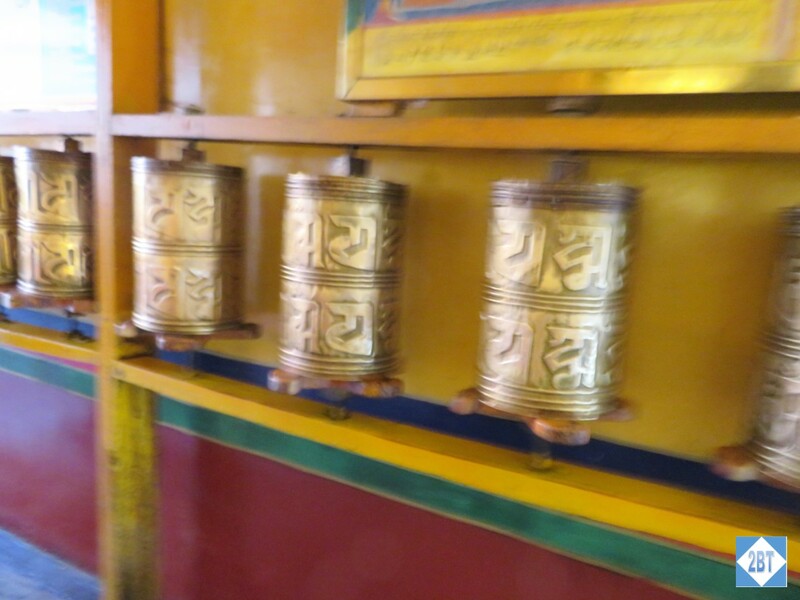 And in the alcove on the way back to the Barkhor Market area were these prayer wheels waiting to be spun. We went back to the hotel for a little bit and some decided to stay in for the afternoon because the altitude was giving them problems. 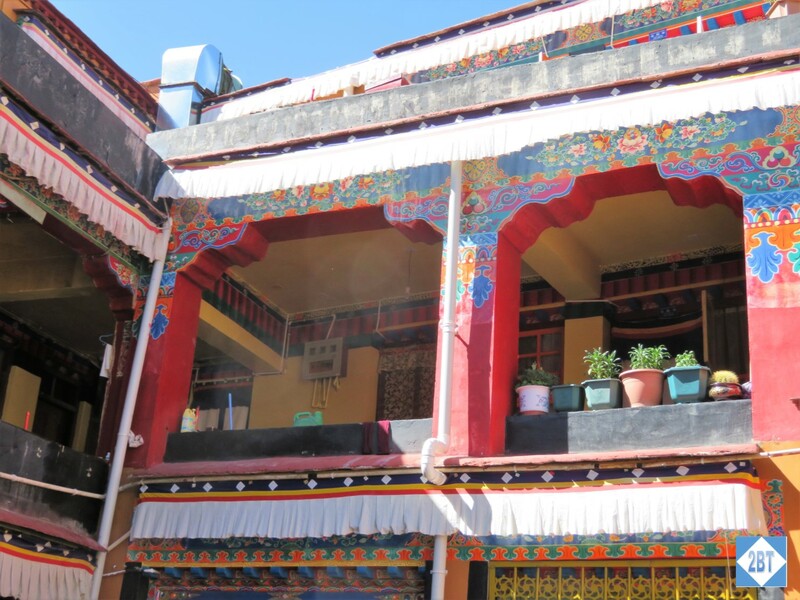 The rest of us got back on the bus to visit the Sera Monastery. 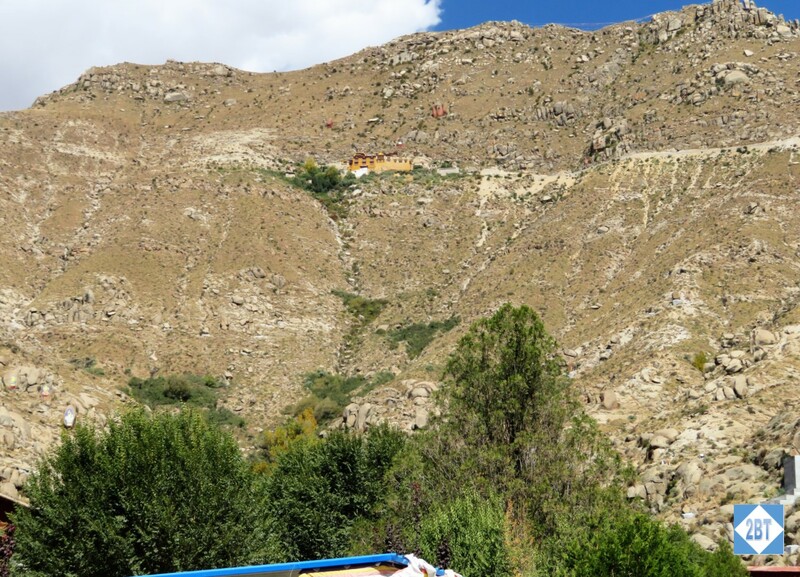 The bus dropped us off in the parking lot and we began the walk up to the monastery grounds. It was only a slight incline to the gates but due to the altitude we could still feel it. Like the nunnery, the monastery had brightly decorated doorways and arches, with yellow/gold, red and blue being the dominant colors. As we passed through the gates, Pen, our local guide, pointed up to this building halfway up the mountain and said that was where we were going. We thought (hoped!) he was joking and he finally admitted he was. 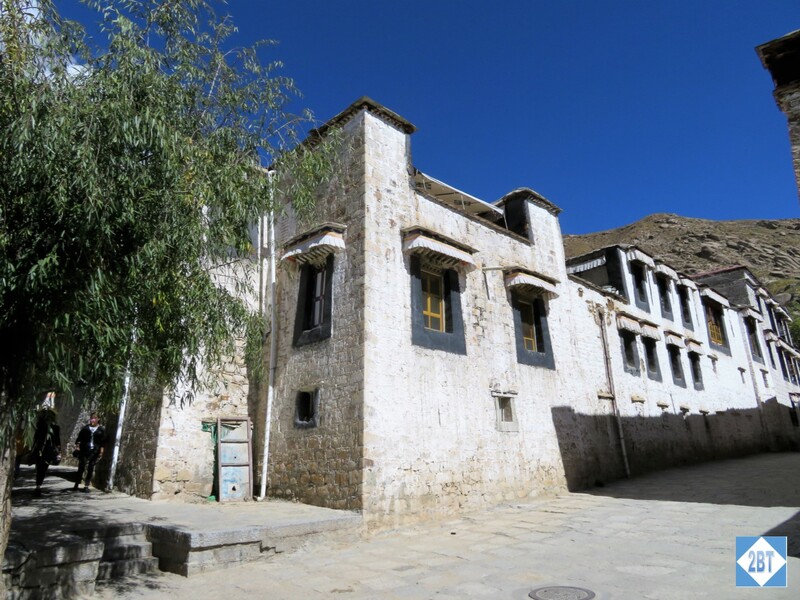 That building is actually the Sera Chöding Hermitage, which was built just before the Cultural Revolution in 1959 and it’s a retreat house built for Je Tsongkhapa, a famous teacher of Tibetan Buddhism who lived in the late 14th and early 15th centuries. At one time the only way to reach it was to climb up from this base but now there’s a road from the other side of the mountain that comes down to it. 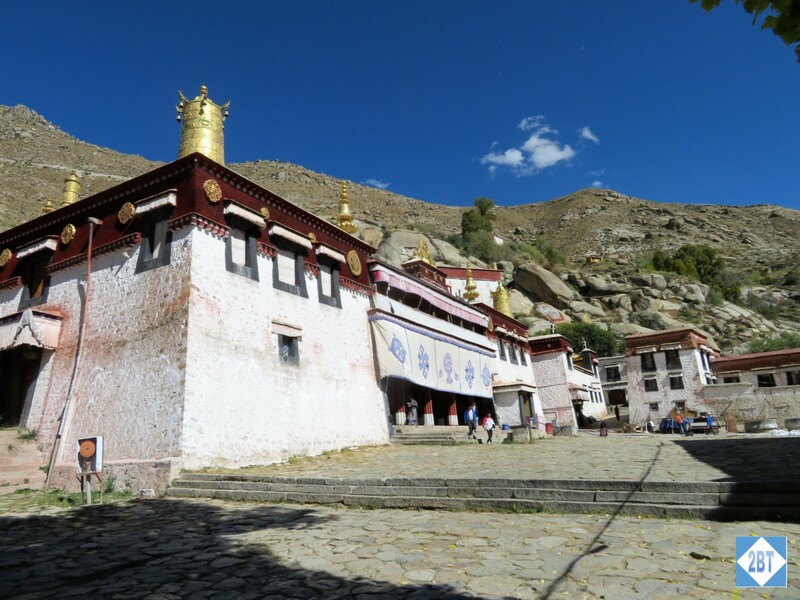 There’s a wide central path leading through the monastery’s buildings and we mostly stayed on that path, just stopping to look at various building exteriors as we went. 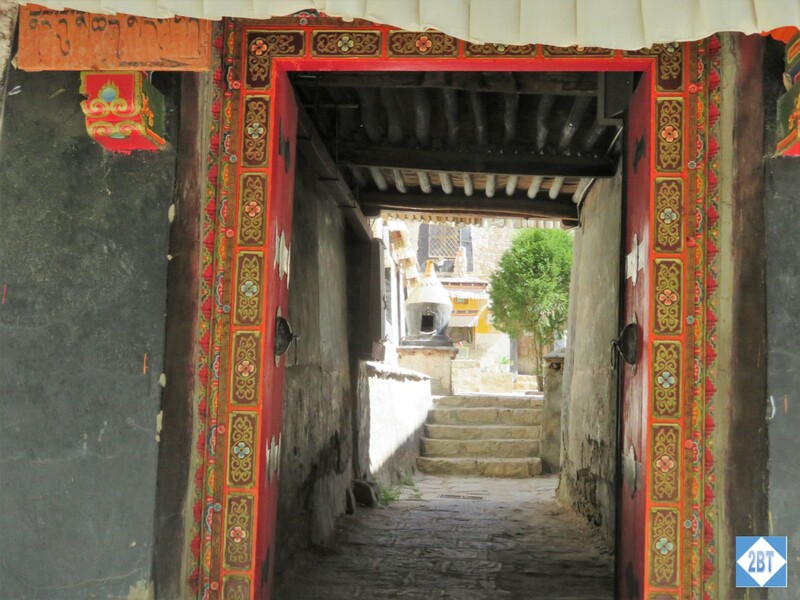 We saw the common themes of highly decorated doors, white-washed buildings and prayer wheels throughout the monastery. The monastery was founded in 1419 and is divided into two main sections: the Great Assembly Hall and dwellings on one side and the three colleges on the other. 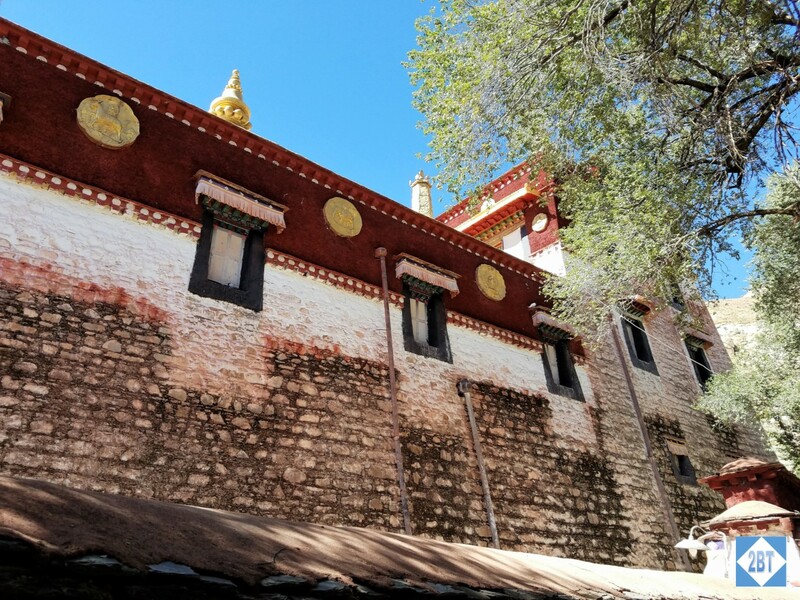 When the Dalai Lama fled to India in 1959, the monastery was bombarded and hundreds of the 5000+ monks who lived here were killed. 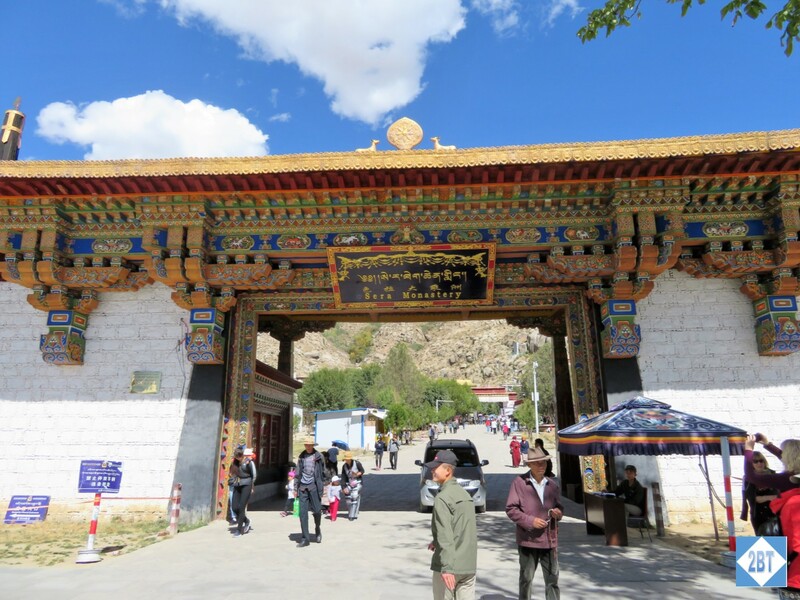 Many of the survivors followed the Dalai Lama to India and started new monasteries there on land provided by the government. 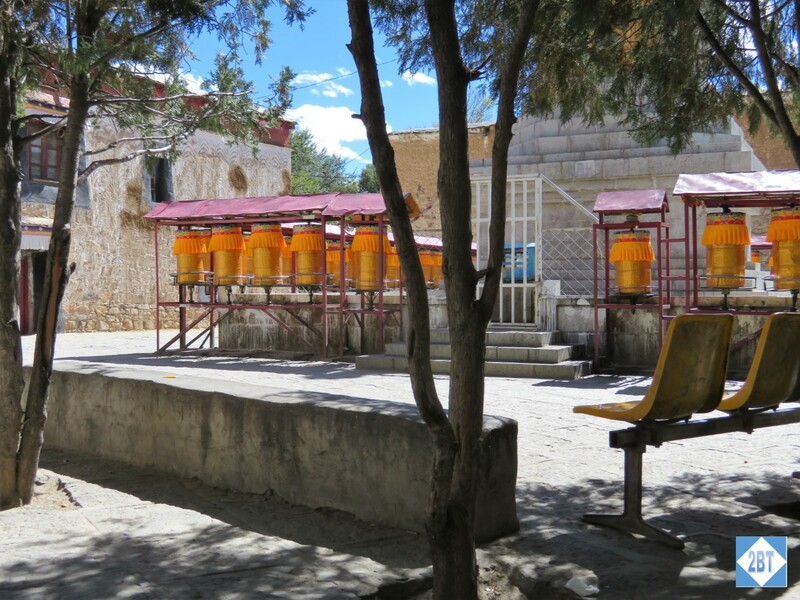 About 300 monks remain at the monastery in Lhasa. Becoming a Buddhist monk is a process that lasts about 20 years and integral to the training is debate. 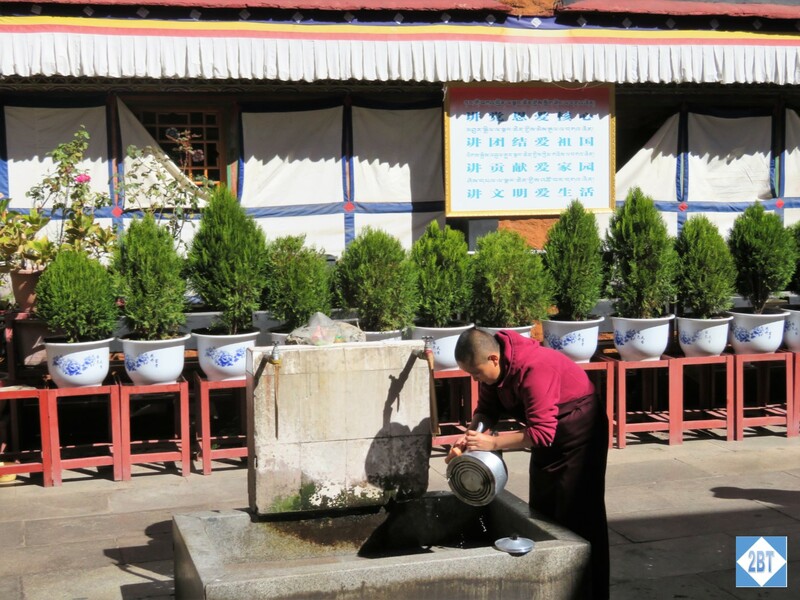 The monasteries have debating courtyards where monks pair up and more advanced (“teacher”) monks ask questions of less experienced (“student”) monks. The teacher presents a case on a Buddhist topic and the student must answer within a specified time. The student is typically sitting down while the teacher stands. Hand gestures, like extending the left hand and slapping that palm with the right hand, mean different things. It was quite something to see the activity of dozens of monks debating in pairs all at once. The name “Sera” means “wild roses” and it’s said that wild roses once bloomed in the area where the monastery now sits. It’s a rather harsh area now with trees but not a whole lot of other vegetation. Still, seeing the debates was interesting and I’m glad we got a chance to do that.